Orders from 4/10/19 to 4/21/19 will be filled on 4/22/19 during our Spring break. Our Roll-on Blends are made to be applied to the skin. Synergistically blended with various Pure Essential Oils and Jojoba Oil as the Carrier Oil. In this Category you will find blends such as "Stress Relief", "Pain Relief", "PMS Relief", "Uplifting", "Energizing", etc. Custom Blends are available. Go to the Custom Blends page to fill out the form or email us with your request. 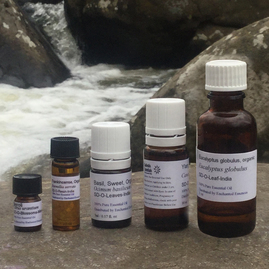 Our line of Essential Oils ("Caelestis Essentials") are Unadulterated, True, Pure, High Quality. The plants from which they originate are all Organic, Wildcrafted, or Grown Free of Pesticides and Tested for Purity using State-of-the-Art Gas Chromatography-Mass Spectrometry. (GCMS). All of our Organic Essential Oils are NOP/USDA Certified which means you can rely on receiving truly Certified Organic Essential Oils. They are 100% pure and natural, free of herbicidal residue, pesticides and synthetic fertilizers. We acquire them from quality distillers all around the world. 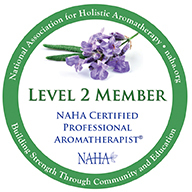 Jeanne Rose, Master Herbalist and Aromatherapist, recognized these oils as high quality. 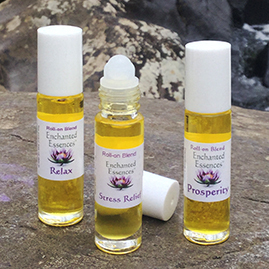 These Blends are created to be used as a Massage Oil, as a Body Oil, or in the Bath. Handmade with our Pure Essential Oils and a Blend of Jojoba Oil, Camellia Oil and Grapeseed Oil. (Organic and Cold-Pressed). These blends come with a pump dispenser for easy application. 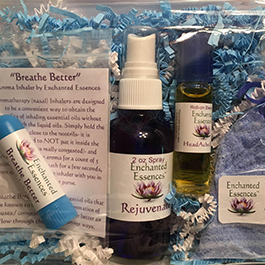 Designed to be a convenient way to obtain the benefits of inhaling essential oils without dealing with the liquid oils. Screw off the cap and hold the tube underneath the nose and Inhale the Aroma for the Therapeutic Effect. 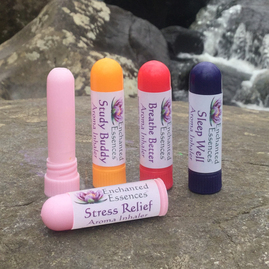 A Stylish Way to Enjoy the Benefits of Aromatherapy! Hand-Crafted. 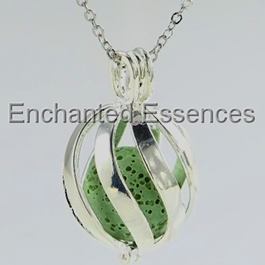 The Metal Locket Pendants contain a Lava Stone Ball. Open the Locket and Apply 1 to 2 drops of Essential Oil onto the Lava Stone and allow the Oil to absorb. Put the Stone back into the Locket and close it. Now it is ready for you to wear. The Aroma will last all day or longer. When the scent dissipates then add more oil. The Glass Bottle Pendants are designed to put a drop or 2 of Essential Oil into the bottle and plug the opening with the cork. The Rope Cord is adjustable. 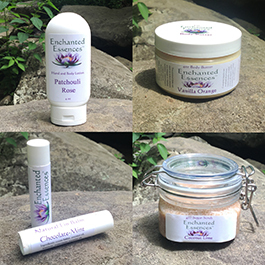 Enchanted Essences creates healthy, non toxic, chemical free, organic ingredients body care products. Handmade (made fresh upon ordering) Body Butters, Sugar Scrubs, Lip Balms, Bath Salts, and New Products in the making. We believe in keeping the ingredients as Simple and Organic as Possible and avoid using any ingredients that have been known to have toxic effects on the body. 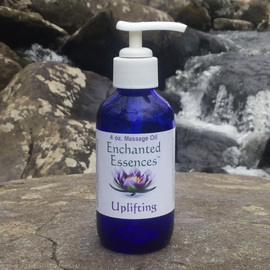 Hand Blended by Enchanted Essences. 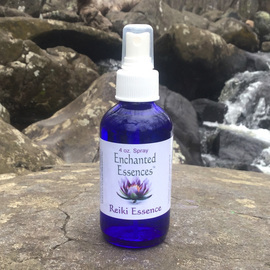 Each blend contains a selection of Pure Essential Oils without Carrier Oils. They are very concentrated and a little goes a long way. 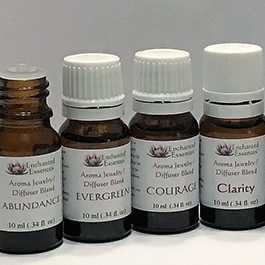 These are to be used on Aromatherapy Pendants and in Aromatherapy Diffusers (see "Diffusers" tab on top of the home page). According to the instructions for your Diffuser add the appropriate amount and enjoy the therapeutic benefits of Diffusing Essential Oils into the air. You can choose one of our Gift Sets or Create your Package by selecting from our Various products and create your own Theme.